When Comic Books Ruled the Earth: Marvel's Marvelous Movies #7: Why was there never a M*A*S*H comic book, or an E.T. adaptation? Marvel's Marvelous Movies #7: Why was there never a M*A*S*H comic book, or an E.T. adaptation? M*A*S*H aired its final episode on February 28, 1983, less than a year after Steven Spielberg's E.T. the Extra-Terrestrial opened to boffo returns on the big screen. These were both cultural phenomena at the time and yet neither inspired any comic book spin-offs beyond parodies in MAD and Cracked magazines. Granted, a M*A*S*H comic book doesn't seem likely. Then again, the show itself didn't seem very likely, either. A thirty-minute sitcom set during the Korean War, premiering on network television as the divisive Vietnam War ground to its disappointing, confidence-shattering denouement? Gee, I hope they fired the doofus who came up with that idea! The series began doing its best to match its big screen inspiration, Robert Altman's groundbreaking satire (at least by CBS-acceptable standards), but eventually became more serio-comic. Its position as a mainstream TV show in a time before cable meant M*A*S*H could never be quite as searing as some of us might have liked (unlike the movie, which openly and mercilessly mocked American traditional values like religion, patriotism and football). But the show still gave us pause for reflection between the laugh-track outbursts with occasional episodes where the doctors work around the clock to avoid being drowned in an ever-rising tidal flow of wounded young men then collapse, exhausted, in their bunks; in its blood-spattered operating theater (no laugh track during those scenes, remember); and even in the way Hawkeye, Trapper John and later B.J., pursue boozing and pranks as a way of maintaining at least a semblance of humanity in an inhuman situation. War has long been an American comics staple, but I can't imagine anyone at either DC or Marvel managing to strike the balance between pathos and chuckles M*A*S*H at its finest managed, though DC seems to have given it some serious consideration. Still, in a world where Gold Key gave kids an exploding, earth-killing H-Bomb in its Beneath the Planet of the Apes one-shot, and Marvel put out comic book adaptations of movie musicals, I'm still shocked we never got a Marvel Super Special or Treasury Edition version of "Goodbye, Farewell and Amen." After all, there were M*A*S*H dolls, for the love of Hotlips! Okay, so maybe a M*A*S*H comic is an even worse idea than a Xanadu comic. But you can't tell me E.T. the Extra-Terrestrial didn't deserve an adaptation. With Marvel doing versions of just about every sci-fi flick out there, including ones that seem to defy your usual comic book storytelling techniques like Close Encounters of the Third Kind, which relied largely on internal conflict rather than fisticuffs and required artists Walt Simonson and Klaus Janson to come up with a new visual vocabulary for depicting photographic light effects with black linework and negative space and ordinary comic book coloring, the lack of an E.T. adaptation leaves a massive gap in the parade of Super Specials in the late 1970s and early 1980s. Its as if the Snoopy balloon burst just before the Macy's Thanksgiving Day Parade took off and they didn't know what to do without it so they just marched along and left Willard Scott and Connie Chung to fill in with banter during the dead zone. Given their performance on Close Encounters, I'm going to stick my neck out there and declare Simonson and Janson would have done a bang-up job on E.T. I remember searching the spinner displays and magazine racks all over town in the months following E.T. 's June 11, 1982, release date. E.T. dolls, E.T. records-- including one narrated by Michael Jackson The New Rolling Stone Record Guide (1983 edition) eventually gave 5 stars (indispensable)!-- E.T. bubble gum cards, E.T. storybooks and infamous video game cartridges. E.T. everything. Except a comic book. So confused was I that I even attempted an E.T. adaptation of my own, written in faux-Marvelese. I managed to do the first two pages. The way I remember it, there was a large top tier panel with E.T. 's spaceship descending from a starry sky. The pencil fill depicting night just about broke me, but I persevered. Beneath that were a couple of panels with E.T. and his space exploring buddies collecting samples. I partially concealed them with foliage not because I felt incompetent to draw them (obviously I felt more than capable, considering the hubris of even attempting something this idiotically grandiose), but because I made the conscious decision to ape the film's opening gambit of mystery and wonder. Quick cut on the second page to the government researchers rushing up and scattering the aliens every which way. I can't remember if I added narrative captions, but I do remember maintaining the government operatives' anonymous menace by framing their figures in such a way the panel rule lines chopped off their heads and other identifying anatomy. And I think I had one of them tersely refer to the Peter Coyote character-- the head guy with the keys-- as merely "the Man." 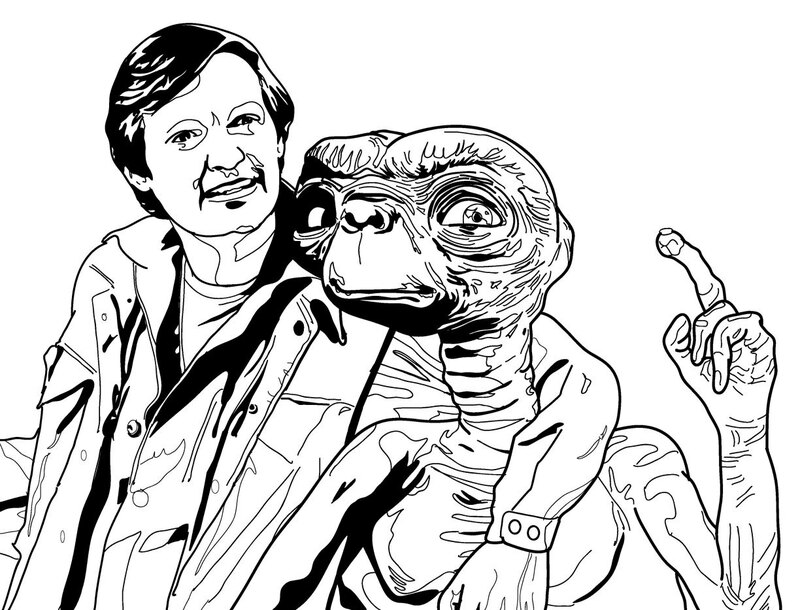 I got as far as painstakingly copying from photo reference the image of a forlorn E.T. gazing down at the city lights, right before the film introduces Elliott and family. That's right. It took me two pages to blast through the first five to ten minutes of the movie and I'm pretty sure most of those panels if I found them now would consist of an arm or a leg against a field of smeared graphite, and then a really large dialogue balloon with something stupid in it. Archie Goodwin I was not. Those pages stayed in the top drawer of my desk at home (always meant to do more when I found the time) until we moved to a new house and I tossed them while trying to dump as much crap as I could to avoid having to pack it. I'd give almost anything to have them back. Maybe I'd even finish the remaining 46 pages or so.